India's national animal is in trouble again. In 2008, when the country was left with just 1,411 tigers, there was a renewed vigour to save the animal. The efforts bore results and tiger numbers rose to 2,226 by 2014, but so did cases of poaching. Between 2014 and 2016, there was a 63 per cent rise in cases of poaching and confiscation of tiger parts in the country. According to a statement by former Union environment minister, the late Anil Dave, in the Rajya Sabha on April 10, there were 19 cases of tiger poaching and seizure in 2014, but the figure increased to 31 in 2016. These do not include cases that are still under scrutiny. The number of such cases was just 14 in 2014, but jumped to 42 in 2016. The deaths took place despite the Centre spending a huge amount on saving the tiger. The National Tiger Conservation Authority (NTCA), the country’s apex body overseeing tiger conservation, allocated more than Rs 15,000 crore to 21 states in 2015-16. The amount does not include the money spent on other wildlife conservation schemes to save the tiger. While NTCA does have guidelines and protocols to save tigers, they are frequently ignored by the states. Take the case of Uttarakhand. NTCA guidelines require tiger reserves to maintain “a beat level ID file of individual tiger, having collation of all available information including photographs, kill data, and camera trap record” using “a combination of radio telemetry, camera traps and pugmarks”. But this was not followed by the administration of Corbett National Park, the country’s oldest tiger reserve, says Rajeev Mehta, honorary wildlife warden of Rajaji Tiger Reserve, a protected area adjoining Corbett National Park. 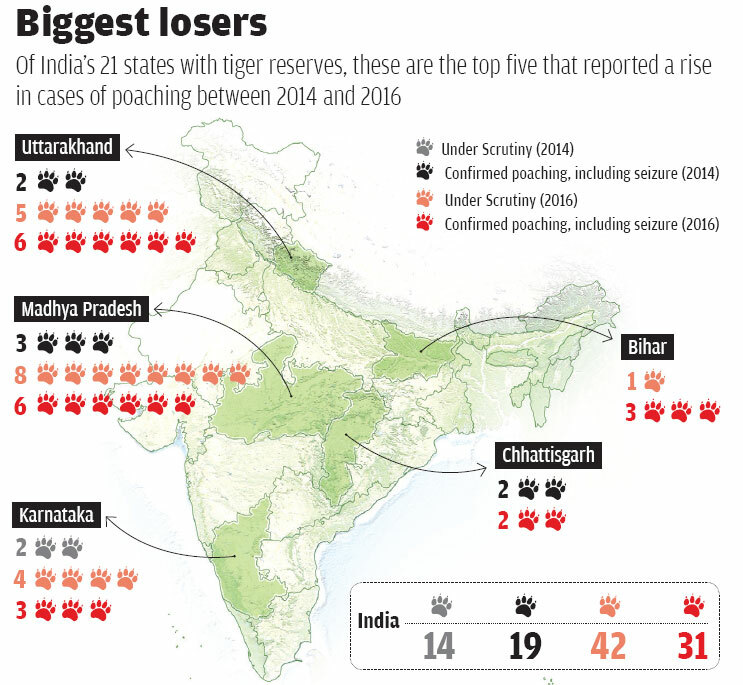 As per government data, there were eight cases of tiger poaching from Uttarakhand in 2015 and 2016 (see “Biggest losers”). “But through an RTI application, I found that there was no monitoring done in Corbett in the period. Why?” Mehta asks. Down To Earth (DTE) has accessed the reply to the RTI application. When contacted, Surendra Mehra, director of Corbett National Park refused to comment on the monitoring process in 2015 and 2016, saying he had only taken over the office last year. Mehta adds that official data on tiger deaths from the park itself is unavailable but at least 20 tigers have been poached from Corbett National Park in the past three years. The estimate, he says, is based on media reports he has been tracking. He alleges that the violation of monitoring norms indicates that the chief wildlife warden of Uttarakhand may be involved. On March 14, 2016, the Uttarakhand police seized five tiger skins from Haridwar. An analysis of the skin patterns by the Wildlife Institute of India showed that four of the skins were of Corbett tigers. One poacher was also caught who led the investigation team to Kotkadar in Bijnaur district of Uttar Pradesh. “We found 130 kg of tiger bones,” says Mehta, who accompanied the investigators. 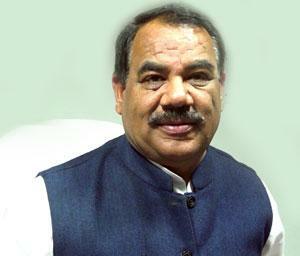 But Chief Wildlife Warden of Uttarakhand D V S Khati has shown no interest in probing the matter further, alleges Mehta. Telephone calls made by DTE to Khati remained unanswered. Mehta says he has written letters to Uttarakhand’s new forest minister, Harak Singh Rawat, accusing the chief wildlife warden of not investigating into the poaching incidents (see “Poachers come from Uttar Pradesh”). “The minister had ordered an inquiry into the issue on April 18 but nothing has been done so far,” he says. 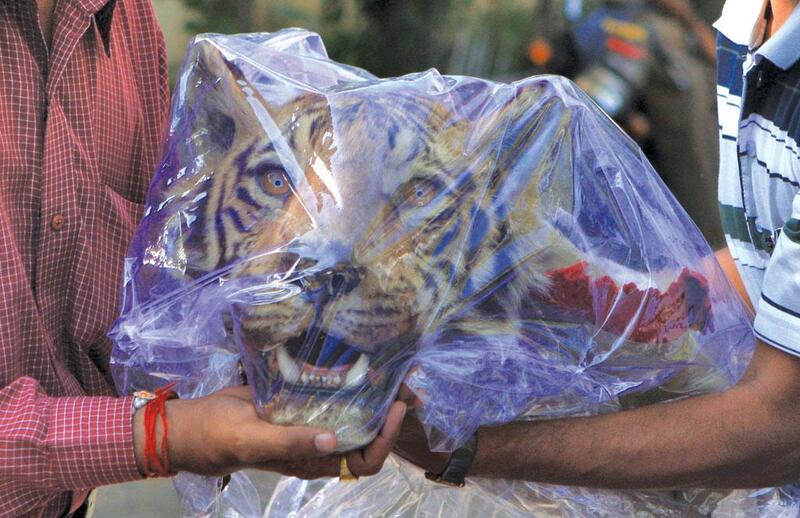 Illegal trade of tiger body parts is quite lucrative. Havocscope, a global black market information website, says tiger skin is sold for $35,000 (R22 lakh) while tiger bone fetches $2,000 (R1.2 lakh). With states of India failing to properly monitor their tigers, poaching has become a high-reward, low-risk proposition. Tiger poaching incidents were highest in Uttarakhand in 2016. What measures have you taken? Areas of Uttar Pradesh adjoining Corbett National Park are responsible for this. When the two states were together, the problem wasn't this big. Now poachers come and go back. We can't patrol that area. We have decided to make a boundary wall on the Kandi road on the border of Corbett. First we'll do solar fencing, then we'll make a boundary wall. This will end the movement of poachers. We are also employing drones. We already have two drones. What is the status of the inquiry into poaching from Corbett last year? I talked to the chief wildlife warden and was told that they have a dearth of funds. I have decided that the revenue from the Corbett will be used for the park. Earlier, only 10 per cent of it was used for the park, now it'll be 50 per cent. Do you think a regional branch of the Wildlife Crime Control Bureau in Uttarakhand will improve the situation? I have talked about this to the state government. We are also going to increase funds for forest guard and the number of forest guards. We are facing other problems too. We need more vehicles and elephants to move around in forests.